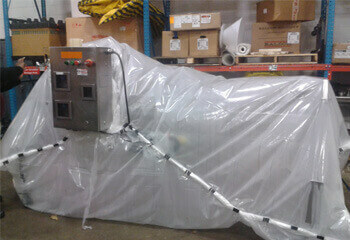 The “superheated steam” produced by the Optima Steamer™ sanitizes and eliminates hazardous food-borne bacteria. Most of pathogens are known to be eliminated at 78°C. The Optima Steamer™ is able to produce constant hot dry steam ranging from 100~135°C at the nozzle tip, ensuring total sanitation of unwanted micro-organisms. Optima Steamer™ is an efficient, nontoxic cleaner that leaves no chemical residue and is very good for getting inside the carcass in areas where chemical treatments may not penetrate. 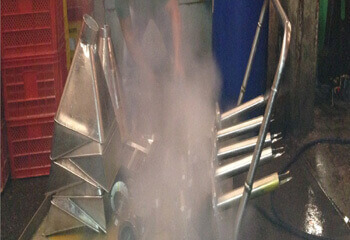 Optima Steamer™ has the ability to rapidly remove soil and provide a sanitized surface throughout the production operation, without major interruption or extensive cleanup that accompanies the more traditional wet cleaning of these types of equipment. Food-contact surfaces such as conveyor belts, crevices, gaskets and dead spaces, as well as areas that are hard-to-clean and sanitize, may harbor biofilms. Bacterial cells in biofilms may be as much as 500 times more resistant to sanitizing chemicals than free-flowing or suspended cells of the same species. Optima Steamer™ has the ability to rapidly eliminate difficult-to-remove animal, food substances and food pathogens from surfaces and equipment.